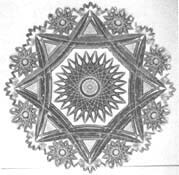 The pattern consisted of a twenty-four point Hobstar, cut in the center of the plate. There were two interlocking, arched double miter squares forming an eight-pointed frame for the Hobstar center. The border, formed by the interlocking squares, was filled with eight small, ten-pointed Hobstars. Curved arches were one of Charles’s favorite cuts; he considered it an honor to rough in the pattern. The pattern described by Crofford is one that has appeared in several publications, always on a plate that is owned by the Toledo Museum of Art. Crofford saw a photograph of the plate (above, left) in an article by John W. Keefe, sometime assistant curator at the Toledo museum who, in 1968, unequivocally called the pattern Kimberly (note 1). Since then, however, most observers have suggested either that the pattern is unknown, or that it is a variation of the Kimberly pattern. Wilson (1994, p. 662), who gives a complete history of the plate’s photo-reproduction, suggests that the plate is cut “with a pattern of unknown name, perhaps a variant of the Kimberly pattern”. The writer believes that it is reasonable to refer to this pattern as “Kimberly Variant” until confirmatory evidence becomes available. The Tuthill company probably subscribed to the U.S. Patent Office publication that reproduced design patents when they were granted. Charles, therefore, had at least a year to become “familiar” with the true Kimberly pattern, because the patent for the pattern was granted on 8 Mar 1892. But how could he have known about the “Kimberly Variant” that Crofford describes? It is unlikely that it was widely cut. There seems to be only that single example in the Toledo museum. It does not appear in any extant Libbey catalog. It should be noted, in passing, that the “Kimberly Variant” does not have two “double miter squares” as stated by Crofford. Both of the patterns illustrated here are single mitered: the variant with two overlapping squares, the patented pattern with two overlapping triangles, each triple bisected. While he was roughing the Kimberly pattern, [Charles] heard himself introduced to the crowd as the “youngest known master glass cutter in the glass industry, visiting from Corning, New York, ‘The Crystal City'”. Praise, indeed, from a competitor! In spite of the quotation marks, no authentication is provided by Crofford. More importantly, the entire scene is just too implausible to be completely believable. In November, 1905, John O’Connor, owner of O’Connor Rich Cut Glass, sent word to Charles that he was cutting an unusually large punch bowl. He thought Charles would be interested in the leather sling his men had developed to hold the bowl during the cutting process…. [Charles] took the trolley to Goshen [NY], to visit with O’Connor…. John O’Connor greeted Charles warmly and escorted him upstairs to the cutting loft. There, suspended above one of the big stone wheel cutting frames, was a beautiful, cased ruby punch bowl, which had been blown by C. Dorflinger & Sons to O’Connor’s specification. The bowl was forty-four inches in circumference and almost one inch thick. The finished bowl, with its pedestal, … would stand sixteen inches high…. [O’Connor’s men] had rigged weights to counterbalance the weight of the punch bowl, which made it easy for the cutter to cut the Parisian pattern and to maneuver the bowl without holding this enormous bowl in his lap. Crofford seems unware that this punch bowl is well-known and has been fully documented. Because C = 2(pi)r, the diameter of the “unusually large”, “enormous” two-part punch bowl can be calculated to be 14 inches, a standard size offered by most full-line cutting shops. Revi (1965, p. 321) calls the pattern “Star”, which may or may not be O’Connor’s name for it — but which no one (except Crofford) would confuse with O’Connor’s Parisian pattern. Revi also mentions that the company in Goshen used “crystal blanks that were imported from France”. Dorflinger is mentioned as a source for blanks at O’Connor’sother factory in Hawley, PA. The punch bowl is shown (in color) in COLORFUL CUTTING, a catalog that accompanied an exhibition sponsored by the Wheaton (NJ) Historical Association in 1991. At that time the punch bowl was owned by the late Harry Kraut, an aggressive dealer/collector of American cut glass. The bowl’s present whereabouts is not known. Readers who do not have access to COLORFUL CUTTING can find the punch bowl (represented by a different photo) on the cover of REFLECTIONS ON AMERICAN BRILLIANT CUT GLASS by Bill and Louise Boggess (1995). The cover photo is correctly identified, but the black-and-white version that is shown as item 446 is not. Was Fred originally using overlapping squares? No wonder he failed. But, Charles, look again, your remedy is no better. In Meriden’s “classic” version of the “Greek Key” motif there is a chain ofoverlapping hexagons. If the hexagons are regular, then each of the six interior angles of each hexagon is sixty degrees. There is no forty-five-degree angle, let alone two, “at the four corners” which, of course, are six in number. 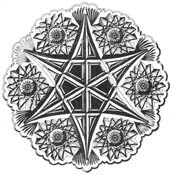 In the next paragraph Charles, on a roll, is shown an example of what Crofford calles “Latticed Rosette and Ribbon”. But the name of this patented Hawkes pattern was unknown to collectors for decades. It, therefore, was given an assigned name, “Latticed Rosettes and Ribbons”, probably during the 1960s. Another case of precognition! Hawkes called the pattern Willow and showed it, so named, in a catalog dated c1911 (Sinclaire and Spillman 1997, p. 86). [5 Feb 1912, or soon thereafter] Charles was aware Tom Mortensen [Mortenson] had been working on a pattern he called Rosemere. Tom had submitted the pattern for a patent, and when he received it, he assigned the pattern [that is, the patent] to the Tuthill Cut Glass Company. Charles was grateful to Tom and changed Tom’s work routine, so that when he had the shop up and running, his priority would be to finish the Rosemere pattern. The writer has been able to find only one patent issued to Thomas Mortenson of Middletown, NY. It is no. 42,367. The application was filed on 12 Jan 1912, and the patent was granted on 26 Mar 1912. This would agree, more or less, with the first statement, above. But Mortenson retained the patent; he did not assign it to the Tuthill Cut Glass Company. As was usual at the time, the pattern is not named in the patent. Pearson (1969, p. 129) shows the patent-drawing, together with two examples engraved on bowls. There is no indication as to whether these examples are signed or not. But they definitely represent the Mortenson patent. The pattern is not named by Pearson. For identification purposes we have given the pattern the name “Floral” because no name apparently exists. In a few photographs that represent the patented pattern in Crofford’s book the pattern is identified as “Daisy”. But, unfortunately, Crofford also uses this name for other, completely different patterns! It is clear that the patented pattern is not the “Rosemere” pattern that dealers and collectors have been familiar with for the past several decades. Examples of “Rosemere” were provided by Pearson in 1965 (p. 99), more than thirty years ago. There is a 10″D plate in Crofford’s book that is correctly labeled “Rosemere”, but this writer can not direct the reader to it for the following reason: The photographs of Tuthill cut and engraved glassware are grouped into two sections of twenty pages each. Unfortunately, these pages are not numbered, and neither are the photographs on them. (Additionally, there is no indication whether the items pictured are signed or not, although most of them probably are.) Crofford apparently is not aware of the meaning of the word “rosemere”. He uses it together with wild rose and, in an extreme case, applies it to an entirely geometric pattern. Wild roses and a band of strawberry (fine) diamonds are the motifs used in the pattern most of us know as “Rosemere”. Who designed the pattern, and when, we do not know. The presentation ceremony of the gold medal was a simple affair…. [C. R. Clifford] complimented Susan and her [Tuthill] company for winning the gold medal for interior decorations(emphasis added). … Clifford [then] led the international jury … to the Meriden Cut Glass exhibit, where [he] awarded a gold medal for cut glass to Thomas A. Shanley, who was representing Meriden Cut Glass Company (emphasis added). Crofford usually indicates that the gold medal won by Tuthill was for “cut and engraved glass”, not for “interior decorations”. His mention of gold-medal winner Meriden is a surprise. Nowhere does Crofford clearly describe the system of awards and medals used at the PPIE. While in New York City [in Feb 1916] Charles, as was his custom, had arranged his time so that he could spend the afternoon on Long Island at the Tiffany Furnaces with Louis [Comfort Tiffany]…. [T]he afternoon was devoted to the discussion of the Panama – Pacific International Exposition…. 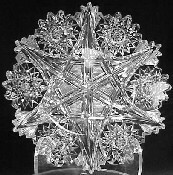 Charles and Louis were impressed with the Meriden [Cut Glass Company’s] display of several examples of the Alhambra pattern, patented by Thomas A. Shanley, and the Byzantine and Theodora patterns, patented by William R. Eliot. All three patents had been assigned to the International Silver Company. If it is true that the “Byzantine” and “Theodora” patterns were displayed at the 1915 exposition (in spite of the fact that they were “old” patterns, both having been patented fifteen years earlier, in 1900), then all concerned were remarkably precognitive because the two patterns were not given these “assigned” names until 1965, when Revi did the honors (Revi 1965, pp. 94-95). The original (official) names have yet to be discovered. While reading Crofford’s book, it became apparent to this writer that the book’s language sounded familiar in several instances. The writer believes that these passages are examples of plagiarism. The book was not scoured for these infractions; they simply called attention to themselves. The reader, however, may not completely agree with the writer. Plagiarism does have its grey areas. To help the reader make up his own mind, plagiarism is defined in this section, and complete, but selected, passages from the book are presented. Whether Crofford’s plagiarisms are inadvertent or not, we shall probably never know. Nevertheless, even if accidental, they are unacceptable. Frederick Crews, in THE RANDOM HOUSE HANDOOK, defines plagiarism as “the serious ethical violation of taking others’ words and ideas without acknowledgment” (Crews 1980, p. 341). Plagiarism, therefore, includes using a source without acknowledgment, as well as paraphrasing a source without acknowledgment. In addition, plagiarism occurs when a source is paraphrased with acknowledgement, but where the words used are the source’s, not the author’s, and there is no attempt in the text to tell the reader which words are the source’s and which are the author’s. This “interweaving” of [the author’s] own words with the source’s does not render [the author] innocent of plagiarism” (emphasis original) (Crews 1980, p. 342). Similarly, Eric Foner of Columbia University, commenting on the alleged plagiarism of the popular historian Stephen Ambrose, is quoted as follows: “As we try to teach college freshmen . . . using a footnote doesn’t solve the problem of appropriating the language of someone else and presenting it as your own” (USA Today, p. D1, 14 Oct 2002). The applicant must prove by examination that he is qualified in German, mathematics, bookkeeping, and drawing. Once accepted, he studies seven or eight theoretical subjects a year. They include German, mathematics, calligraphy, glassmaking technology, glass chemistry, design, technical drawing, and drawing from nature. . . . Meanwhile, practical engraving increases yearly, reaching twenty hours a week in the third year. At its end the appretice may have mastered the use of 100 or more engraving wheels.The journeyman’s certificate requires the student to pass a comprehensive examination on the three years’ theoretical subjects. His engraving and design skills are judged from a work of his own design, which must incorporate all he has learned. [Applicants] were tested for proficiency in German and their ability to learn such subjects as bookkeeping and mathematics. Their apprenticeship included studying seven or eight academic subjects throughout the years. The subjects pertained to such things as glass-making technology, glass chemistry, German, designing, math, nature drawing, penmanship, and technical drawing. The actual training at the wheel increased yearly. During his third year [the apprentice] was at the wheels twenty hours a week. By the time the Bohemian apprentice had completed the journeyman’s apprenticeship, he should have mastered as many as one hundred wheels. To obtain a journeyman’s certificate, the apprentice had to pass a theoretical test on the subjects studies as well as submit his engraving to be judged based upon a pattern of his own design. The design was to demonstrate all of the skills the apprentice had learned as an apprentice engraver. . . .
1. The Sinclaire and Spillman quotation was written by Estelle F. Sinclaire who acknowledges Max Roland Erlacher, a master engraver trained in Austria, who “supplied this information about apprenticeships” (Sinclaire and Spillman 1997, p. 327). Crofford, therefore, plagiarizes two individuals: Sinclaire and Erlacher. 2. The three dots at the end of Crofford’s paragraph represent the following statement: “It was a requirement and a tradition in Bohemia, that master engravers were fine gentlemen.” The reference given is to Battie and Cottle, 1991 (with no page citation). Because it is unclear whether this reference pertains only to this sentence or to the entire paragraph (in spite of the fact that the latter is based on Sinclaire and Spillman, 1997, as demonstrated here), Battie and Cottle’s survey was examined. The “gentlemen” quote can not be found there; nor can one find any detailed information concerning the training of central Euopean glass engravers. Crofford’s reference is, therefore, bogus. He likely obtained his “gentlemen” sentence from a different place in the Sinclaire and Spillman book: “The moral standards and dignity required of Master’s candidates cannot be overemphasized. Corning’s engraving Masters . . . were ‘fine gentlemen’, as tradition required them to be. . . .” (Sinclaire and Spillman 1997, p. 24).